Pictures circulating on WhatsApp of trapped cars in a flooded highway, claiming to be in Singapore, were actually taken in Malaysia. Two Stompers alerted Stomp to the circulated pictures, which were accompanied by varying messages claiming that the flood occurred along the Marina Coastal Expressway (MCE) and on the Kallang–Paya Lebar Expressway (KPE). One of the Stompers said: "I don't know where it happened, my friend sent it to me." The other Stomper was also unsure of the location of the flood. In the circulated photos, a flooded expressway can be seen with people standing or sitting on the roofs of their vehicles. Another picture shows several barricades floating in the water, at an exit of the highway. However, the photos actually show a flash flood that hit Jalan Tun Razak tunnel in Kuala Lumpur on Nov 11, due to heavy rains that evening. Online news website Malay Mail stated that it had been raining for nearly two hours and that five people had to be rescued from the flood. The Fire and Rescue Department of Malaysia received a distress call about the incident at 5.56pm on that day, according to The Star. The department said in a statement that they took 10 minutes to rescue the victims at the scene, and that no one was hurt. The situation was said to be under control by 8pm. 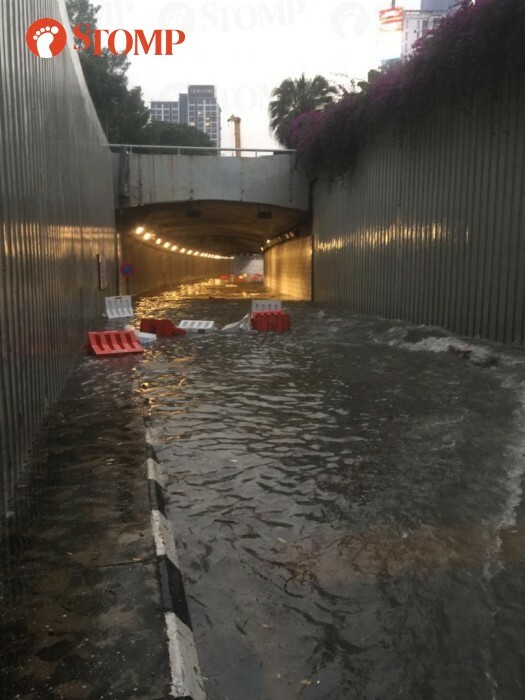 Aside from being mistaken for a flood that happened in Singapore, the photos were also circulated on Facebook and said to have taken place along the Stormwater Management And Road Tunnel SMART Tunnel in Malaysia. According to The Star, SMART Tunnel issued a statement to clarify the matter. They said that the tunnel was clear as they had closed their roads to prevent flooding from occurring.